Lily Pons and I corresponded during the last ten years of her life. We never met face to face because she wanted to “preserve the mystery” (garder le mystère), but the letters, all in French, were personal and revelatory. 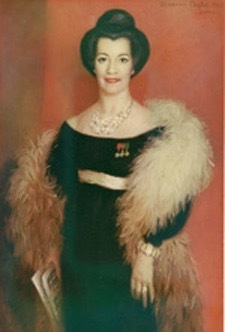 She was the archetypal prima donna, remaining forever “Mme Pons” to me, though I quickly became “Mon cher ami” to her. 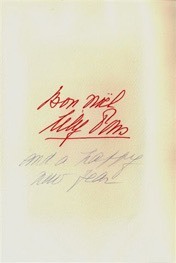 Her annual Christmas message, the epitome of elegance—a handwritten “Bon Noël, Lily Pons,” embossed in red—never changed, though the cover of a given card likely contained a reproduction of her most recent portrait (the one above graced her 1967 greeting). She was thrilled that I programmed so much French music in recitals and particularly wanted to hear the tape recording of Jacques Leguerney’s beautiful cycle “La nuit,” which John Moriarty and I gave what was believed to be its first U.S. performance, in Boston in 1971. She considered the secrets of her vocal longevity to be quite simple (“I arose early and went to bed early; I didn’t smoke and I didn’t drink, except for a glass of wine with my meals”). She wrote lovingly of old colleagues. In her prime, she was the toast of the entire music world, not just the operatic branch. George Gershwin, among other projects, was writing a song for her at the time of his death at thirty-eight in Los Angeles of a brain tumor. (It was completed decades later by another American musical genius, Michael Tilson Thomas, and called simply “For Lily Pons.”) At the memorial concert given by the L.A. Philharmonic in honor of the composer at the Hollywood Bowl on 8 September 1937 (attended by 22,000 people), it was Lily Pons who performed “Summertime.” The extraordinary haute colorature voice she possessed, and in particular her way of using it, in recent years have too often been written off in terms both condescending and disrespectful. 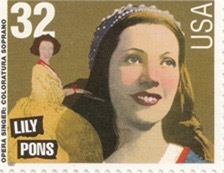 Though life presents few certainties, here’s one: there isn’t the remotest possibility that any of those who delight in sneering at Lily Pons will rate a United States postage stamp, an honor posthumously bestowed upon the petite French nightingale (a proud naturalized citizen) in 1997, an apposite final commentary on her status relative to theirs in the cultural history of the land.